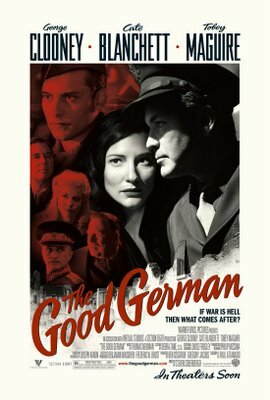 On December 22nd Warner Bros. Pictures will release THE GOOD GERMAN in theatres nationwide. The film is directed by Steven Soderbergh and stars George Clooney, Cate Blanchett and Tobey Maguire. Given the title it is our opinion we will be unable to sufficiently suspend our disbelief to enable us to actually sit through this film's 105 minute running time. Accordingly, there will not be a review posted on this website. Further proof that Clooney is loony. The non-Aryan staff at Needtovent Headquarters recently discovered that access to our Comment Link for THE GOOD GERMAN has been interferred with on several occasions. While there is no absolute proof, we naturally suspect the Brown Shirts of the Landa Park Polizei. Beware. Grosser Bruder sieht zu.